Jasper was born on 5 FEB 1860 in Benton County, Arkansas, the son of unknown parents. He died on 1 DEC 1910 in Washington County, Arkansas. His wife was Martha Jane Woods, who he married on 15 FEB 1885 in Benton County, Arkansas. Their three known children were Infant Son (1886-1886), Mattie Belle (1888-1889) and Myrtle (1889-1955). Jasper F. Cavness (aka Caviness) was born on Pea Ridge in Benton County, Arkansas, on February 5, 1860. His father was John Perry Cavness (January 22, 1835 to March 7, 1862) who, with his brother, died fighting for Arkansas at Elk Horn Tavern during the Civil War Battle of Pea Ridge. John Perry Cavness was born at Sugar Creek, Benton County, and was only 27 at the time of his death. His mother was Louisa F. Walker Cavness. 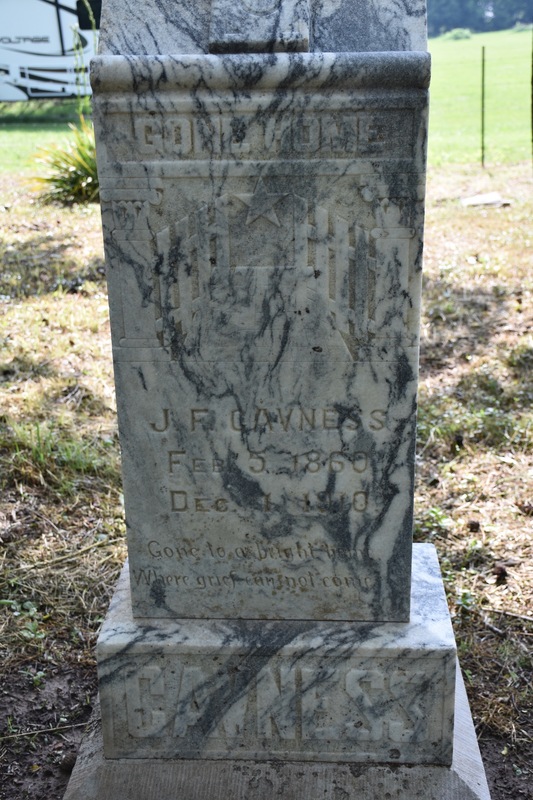 Jasper had one brother, William D. “Willie” Cavness, born 1861, who died in 1870. His paternal grandparents were Edmund Demond Cavness and Rebecca Mitchell Cavness. Rebecca was born in 1811 in Tennessee and died after 19 Jun 1880. Both Edmund and Rebecca are buried in the Cherokee Cemetery, Cherokee, San Saba, Texas. Jasper's widowed mother apparently married a Mr. Garrett, there being a half- brother, Professor J. E. Garrett, and four half- sisters. From youth, Jasper F. Cavness showed a desire for a good education and by personal energy and effort he obtained a liberal education through the high schools and academies of the county. He received the highest grade certificates from county examiners. On February 15, 1884, he married Miss Martha Jane Woods, aka “Mattie,” born May 17, 1864 in Benton County, to Robert Samuel Woods and Martha Jane Maxwell Woods. Jasper and Mattie were the parents of three children, two of whom died in infancy. A Cavness infant son born and died 1886 is buried in the Woods Cemetery. Their child Mattie Belle Cavness, born March 17, 1888, in Little Flock, and died June 9, 1889, is also buried in the Woods Cemetery. Their surviving child was Mrs. V. S. (Myrtle Cavness) Williams (1889- 1955). The title of “Professor” was conferred upon Jasper F. Cavness as a courtesy after having taught in schools of Arkansas and Oklahoma for twenty-five years, according to his published obituary, “giving general satisfaction to his students and patrons.” He was also Superintendent of the Schools at Tahlequah, Oklahoma. County, Arkansas, at the age of 50 years. He is buried next to his wife, Mattie Jane, and their children in the Woods Cemetery, Little Flock, Benton County, Arkansas. Martha “Mattie” Jane Wood Cavness died on December 17, 1946, in Neosho, Missouri, having resided with her daughter for many years. She was 82 years of age. A legacy of Jasper F. and Mattie Jane Cavness is the beloved family of their descendants. They are among those who lived their lives, did their work, enjoyed their time, grieved their losses and are often forgotten. Mattie was a lady, like so many others of her time, who gave her life to be a faithful wife and mother, a link for generations to come. As a faithful teacher of youngsters for 30 years, Professor Cavness's influence now silent and seldom recalled, is nevertheless of great importance to thousands of current citizens whose lives are enriched by the knowledge and life lessons long ago passed to his many students.